With the Nintendo DSi, Nintendo has added some smart nips and tucks to its already svelte handheld games console, while adding a raft of useful multimedia features. Note to Nintendo: I'm going broke with all the different versions of your gaming handhelds. With this third iteration of the Nintendo DS (that's since December 2004), the Nintendo DSi tacks on a number of extra features while slimming down. It's a two-lensed digicam, it's a sound mixer... and, yeah, it still plays games on its two screens. So when the DSi launches this year, should you buy one? Let's count down some of the things we love - and hate - about this new mobile gamer. And break down what it means to you. 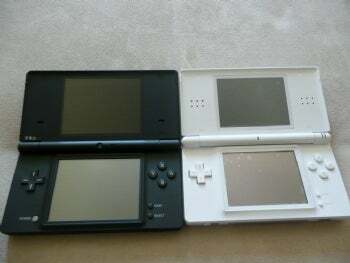 LOVE: The DSi keeps roughly the same dimensions as the DS Lite while slightly increasing the screen size (the new touchscreen measures about 1.96in by 2.59in; by comparison the DS Lite's touchscreen measures 1.81 by 2.4in). It has a slightly textured coating - an almost Lenovo ThinkPad-like rubbery-ish coating that makes the machine comfortable to touch. The new style puts the power button on the front face and moves the volume control to the side. All handy little changes, for sure. And it's good to finally see SDHC card support in this gaming handheld, as well. Thanks to these changes - and the removal of the GameBoy Advance backwards compatibility slot (which we'll get to in a second) - the DSi gets a hair thinner than the DS as a result. HATE: Kiss backwards compatibility goodbye: The GameBoy Advance slot is gone. Such is the price of progress. I suppose I can live with the fact that we're getting cut off from older games. What I don't get, though, is why, with every single redesign of a Nintendo DS, the company changes the pin-out of the device so that you need a different charger. Would it really kill Nintendo to have a standardised plug to pull power from? And, while we're at it, why not use plain-ol' mini-USB cables? They work on everything from MP3 players and digicams to the Sony PSP. That's saying nothing of hooking that mini-USB cable into a computer to let you easily navigate files sitting on your device's memory card. I can do that with cameras, and I can do that with smartphones. Why not with a DSi? LOVE: It is a fully functional music player. Well, fully functional in that you can play back some audio formats. The DSi can play AAC files (with .m4a, .mp4, and .3gp file extensions). But what's gonna rope in some creative chip-tuners and budding DJs are the small audio recording and mixing abilities of the DSi. You can store up to 18 different 10-second sound bites. From there, you can add a couple of goofy effects, change speed and octave - or just have a stable of sound samples on hand whenever you're around town. Hey, you never know when you'll need to hit the Sad Trombone. LOVE: Two tiny 0.3Mp cameras (one facing outward, one pointing at the user) allow you to take pictures, while software lets you add effects and edit images. A host of crazy features enable you to do everything from futzing with faces you snap to selectively stripping out colours. Then you can take those edited images over to your computer with an SD Card. Overall, the two cameras do a servicable job, and I can't wait for some of the applications like WarioWare Snapped that'll take full advantage of the two lenses. HATE: The 640-by-480-pixel resolution cameras are perfectly capable of creating something suitable for Facebook. Not that you're expecting to print family photos with these shots; also, the camera is best suited for well-lit areas - so don't expect to craft any stellar shots in a dimly lit bar. But why do I have to keep my expectations low? £50 mobile phones have better-resolution lenses.